Earlier today, Hulu.com announced Hulu Plus. For those who don't know what Hulu is, it is a company that allows users to stream TV shows to their computer over the Internet the day after a show is broadcast. The TV programs are only on Hulu for a couple of weeks on average. The company was started jointly by NBC Universal and Fox TV, although ABC and other companies now have a stake in it as well. The networks have made it clear in the past that they did not want Hulu content on your TV; it was meant only for watching at your desk on your computer. That is, until today. Hulu Plus has two parts. First, instead of just being able to watch the most recent couple episodes, the entire archive of the show's current season (and maybe past seasons) would be available with a Hulu Plus account. Also, many older network shows would have every episode produced available for streaming, including old shows such as Ally McBeal, The X-Files and some Saturday Night Live. Second, Hulu Plus allows you more ways to watch these programs. Along with the Hulu Plus announcement they released a Hulu Plus iPhone/iPad app. Also, Hulu Plus is available via a software update on Internet-enabled Samsung TVs and Blu-Ray players. Also, in the coming months, they have announced streaming to Sony and Vizio players/TVs. And finally, the content is available up to 720p HD on these devices as well as other streaming devices in the coming months. Hulu Plus is going to cost $9.99/month. Sounds great? Hardly! Paying the $10 does not get rid of ads. It might get you less ads; but mostly it gives you more content to watch. However, for as little as $8.99/month, you can get much of this same content on Netflix streaming (as well as rent a DVD or two). OK, Hulu will exclusively have newer episodes than Netflix because Netflix doesn't get them until on or after the season is released on DVD, but even then Netflix doesn't have ads at all. I guess some people may pay the $10 for the content, but I don't think many will. What shouldn't be happening? Using the iPhone/iPad app and watching it on your Samsung player is only available to Hulu Plus members. What?? That's right, Hulu has an iPhone/iPod app, but you can't use it unless you pay for Hulu Plus. This makes NO sense!! Sure, list the content that they can't access and try to charge them the $10 if they want to watch it, but making a subscription to watch Hulu videos on your iPhone is just ridiculous. Right now, you can watch hundreds of episodes of shows on your computer for free, but you can't watch these shows on iPhone/iPad or Samsung. My guess is that the smart folks at Hulu get it; they would love to show us all the content whenever possible. However, because of their ownership by the networks and the content being tightly controlled by the networks, their hands are tied. What the networks seems to be trying to do is still make it easiest to watch the show on your TV; if you miss the show, then watch it on Hulu later. News flash, Hulu: Most of the people I know never watch live TV, and half of them don't even own a TV. One reason they want to make you watch TV is because they show advertisements on TV within the content and that's still where they make the most of their revenue. They need to figure out that they should be in the same business with Hulu: selling ads. They can sell more targeted ads to viewers on Hulu and they could still run 3-4 engaging ads per commercial break and most would still watch. Also, make the content (with the ads) available to anyone who wants to watch it on their TV or iPhone. People who don't want to tune in every Thursday at 9/8c can watch on Friday on their Blu-Ray player or iPad and the networks still get their money, even if they don't get the bragging rights that they own Thursday night. The television networks are delaying the realization that they do not control the thoughts of America. The movie Network documented that era thirty-four years ago. People have more to tune into than ABC, NBC, CBS, and Fox. They have the Internet. They have a happy hour with friends. They have a movie to watch. If tools like Hulu aren't expanded to reach more people and more places, the networks are going to quickly find that they have no audience any more. OK, so it seems that this blog is all about Apple these days. Hopefully one of these days I'll get some other subjects. But hey, I know some of you like to hear my thoughts. First, here's the details. It's called the iPhone 4. It's not the iPhone 4G because it doesn't have 4th generation data network services. It's got a new look, with glass covering both the front and the back. There's a steel band around the sides, which makes up antennae for WiFi and cellular networks, which will hopefully increase the reception of signals on the phone. There's a second microphone on the top of the phone which will help for the audio of the phone by canceling out background noise. Also, the phone has a gyroscope in the phone in addition to the accelerometer and compass for superior six-axis movement. This could supply more responsiveness in games and the so-called "augmented reality" apps. The iPhone 4 features the same A4 processor as the iPad, which means it will be nice and snappy. Also, the display is still the same size but features 4x the pixels of the old 3GS. Apple has called this Retina Display because at a normal viewing distance the human eye cannot detect the pixels on the screen. This definitely is a new and interesting move for Apple; no consumer electronics device has ever boasted a screen this detailed. The word from the journalists who have seen this is that you have to see the display to believe the detail. Last year the iPhone 3GS debuted with a decent camera. The iPhone 4 sports a 5-megapixel camera with a small LED next to it to use as a flash or even continuous lighting on video recordings. The camera can record 720p 30fps video. They even announced a $4.99 iMovie app that allows you to easily edit clips together, overlay music and titles, and a bunch more. I doubt I'd ever use that, but it's pretty cool. 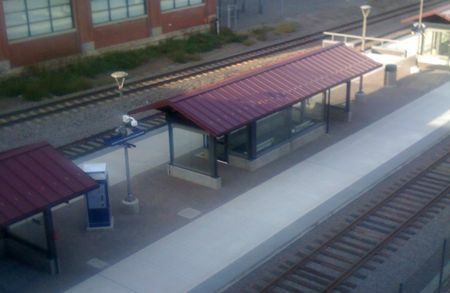 A low-resolution camera is also included on the front above the display. It seems that you can take photos and even video with that camera as well. But Apple also introduced a new featured called FaceTime, which allows you to call up an iPhone 4 user and move the call to a Wi-Fi video call. It's that thing that futurists and sci-fi writers have been saying for decades--people holding up their phone and talking with another person while staring at them. Apple was pushing this for most of the last decade with iChat on their Macs, and now it's on the phone. However, right now it will be on iPhone 4 devices. Apple said they are making it an "open standard", but it's very unclear what that means at this point. For example, Skype wanted to say they'd work with the FaceTime protocol but then they backed off on that statement. Apple made some emotional pleas for the usage of FaceTime with a husband watching his baby's first steps over the phone and some deaf persons communicating via sign language. Unfortunately, FaceTime does not work over the 3G network, only wireless networking at this point. It may be a cool, new, exciting thing that everyone will be using someday, but I think it's got a long way to go before that. Of course, the new iPhone 4 includes all the features of the iPhone OS 4 that they previewed a couple months ago. Oh yeah, and it's no longer called "iPhone OS", it's now "iOS" because it's not just iPhones and iPod Touches anymore. One new addition to iOS 4 that I like is multitasking also includes shortcuts to the music player control for the program that is currently playing music. Also, this music control screen includes a button to lock the orientation, which is great for when you're trying to read your phone while laying down and making sure the iPhone doesn't try to switch layouts. So what's the cost? The iPhone 4 starts at $199 for a 16GB model and goes up to $299 for 32GB. The old iPhone 3GS at 8GB is now available for $99. Anyone whose 2-year AT&T contract expires before the end of the year is eligible for an iPhone upgrade with an $18 upgrade fee. Otherwise, if you want to start a new contract or not have a contract, you will have to pay hundreds of dollars more. Apple's iPhone 4 will be available in stores and shipped to your door on June 24th with pre-orders starting this Tuesday, June 15th. Apple iOS 4 will be available for download for iPhone 3G, iPhone 3GS and iPod touches on June 21st as well. 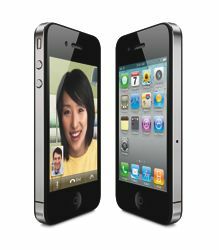 Of course, the iPhone 4 will be available almost everywhere around the world by the end of the year at various prices and plans. So what do I think? I'm probably going to be getting one within the next month. I do want to see how the iOS 4 performs on my iPhone 3G on June 21st. However, the 3G has a much slower processor and will not be able to do the multi-tasking features that newer phones will be able to use. When I got the phone almost two years ago (and even last year), I didn't really care about the camera. But after a couple years of use, there's enough times I want to casually take a photo or two and the 1-megapixel camera on my 3G doesn't really count. This 5-megapixel camera will be nice for off-the-cuff concert photos and reviews of locations via Twitter and may be actually enough to use in family photo collections and such, so that will be a bonus as well. In short, the iPhone 3GS these days is a bit slow and I wouldn't mind getting a new one, and since it seems I can do so for a fairly small price (and a new two-year contract), I'll probably make it happen. This past week has been a big one for Apple, everyone's favorite/love-to-hate electronics/computer company. Two weeks ago, iPad apps and reviews started showing up, then Saturday brought the iPad to thousands of Americans (for a $500+ fee). Then, last Thursday, Steve Jobs and other Apple executives gave developers and press a peek at the fancy new features coming to iPhones and iPod Touches this summer. (Of course, there's no word on if there will be a newer, cooler iPhone this summer, but most likely there will be.) It seems to me that the future of Apple's touch-based devices is bright; it features a brand new device and some much-needed updates to currently available devices. First up, we have the iPad. After seeing it in person, I can confirm that it is, in fact, mostly just an iPod Touch with a large screen. On the other hand, it's easily the most compelling tablet device to date despite a decade of Microsoft trying to get people to run Windows with their finger or a stylus. The big difference? Apple and the thousands of developers who have already released iPad apps have created these programs to use the user's fingers for inputting data. Windows has always been built for a screen, a mouse and a keyboard, but the iPad is made for you to swipe your finger across the screen and press the big buttons. It's also a very bright, glossy screen that seems to make anything on the device pop. E-mail and web browsing are a breeze, given that you don't want to write a very long post on the keyboard that pops up onscreen. (On the other hand, you can use any Bluetooth wireless keyboard if you'd like to type more and can't hack it with onscreen keys.) Of course, it's also great for watching movies or reading books as well. Since the iPad hit stores, there have also been some great new iPad-specific applications released to the enjoyment of the world. Although Hulu hasn't yet released an app to watch all their TV shows, ABC.com has released a beautiful app to watch all their TV shows. For those who have a Netflix subscription with Instant Streaming capability, you can watch anything they offer over streaming and it looks great as well. One of my favorite apps to play around with a bit was any one of a couple of air hockey apps where two people could move their finger around the screen to control their virtual air hockey paddle and move the virtual puck into the other player's goal. And finally, bordering on the insane (or at least the "I spent $1,000+ to do what I could've for $15"), there's a cool version of Scrabble for iPad where you can use your iPhones as your personal letter rack and then flick them off the iPhone screen and they will show up on the iPad ready to place them. As usual with new technology, some are useful and some are just cool, eye-catching demos that people will most likely never use. In my opinion, it's a great device. However, as fun as it would be for me to have one, there's no way I can justify the $500+ price tag. I'm not saying it's too expensive, it's just that I have very little use for the iPad in my life. I carry a smartphone device and need a computer to do more substantial work on, and anything I can see using an iPad for I can do just as well on one of these other devices. (Don't worry, Apple, both my laptop and phone are also Apple devices, so you're not losing out that much.) It's still early days in such technology, though. I can see a potential future where most of us are using iPad-like devices instead of laptop computers in ten years, but considering that this device has been out for just over a week, it's hard to say if that will come true or how the technology will mature. The first big feature request is to listen to streaming audio just like the iPod functionality; the audio will continue to stream and play in the background while using other applications or browsing the web or e-mail. The company Apple chose to demo this was Pandora, the personalized online streaming service. The streaming worked great and there was even the ability to control Pandora while the phone is on its lock screen. Seems like just what iPhone users such as myself wanted, even though I recently found that you currently can load an mp3 audio stream into Mobile Safari and it will also stream while other programs are running. The next demo was an impressive one from the folks at Skype. The features that Skype was able to now access made Skype nearly as powerful as the regular phone. Skype is able to maintain an online connection and even receive calls while the phone is running other applications or in its locked, standby state. If it's as good as Apple and Skype are saying, you could use a recent model iPod Touch as a Wi-Fi Skype phone for a lot less than a cell phone's fees. As Apple explains it, this multitasking is not full multitasking because the full Skype program is not allowed to run in the background, but it's definitely enough to do the things users really want. The last couple features available for running in the background are, first, location awareness. Programs such as Foursquare and Gowalla could keep track of location history and allow you to check in after the fact. Of course, Apple's first priority is battery life over function, so they say that these programs would only get access to cell phone location and not the battery-hogging, more detailed GPS location services. Secondly, the ability to continue tasks in the background. In the example mentioned, the Flickr app could finish uploading your photos in the background while other apps are running. It's not clear if you have to trigger these background activities before leaving the app or, for example, popular Twitter apps could periodically download new Twitter updates like the built-in e-mail app does. One video demo that surfaced online did verify that you can kill background apps if you wish, but it seems that any app you leave will stay in the list of apps that could be running some of the limited multitasking processes. The apps that are the base of the iPhone also get new features with iPhone 4.0. The e-mail application will now have a global inbox; if you have more than one e-mail account, the e-mails can be viewed on one screen just like in desktop apps. Also, the e-mail now can organize by thread, which was probably the original killer e-mail feature of Gmail when it debuted six years ago. Many people have pages and pages of apps on their home screens, but thanks to the new ability to put apps into folders, better and more organization can be gained without all that horizontal swiping through screens. And, finally, some of the flagship features of iPad will be included in iPhone 4.0, such as the ability to read iBooks from Apple's bookstore and connect to other devices such as Bluetooth keyboards. There are also other small features that we haven't even heard about yet but will likely be welcome additions to the iPhone OS this summer. Of course, a number of features that Apple were excited to tout were better tools for corporate IT personnel to manage their iPhone users as well. Apple's other major announcements for iPhone 4.0 are mostly new platforms for even more growth on the iPhone/iPod Touch market. The first was GameCenter, a programmer API and gaming network. This further cements these devices as a legitimate gaming platform and will give users a consistent user account, friends list, and high scores. The screenshots showed the ability to see what games your friends are currently playing/watching as well as the ability to view high scores and get achievements for progress in games. The major bad news? Unless you bought your iPhone or iPod Touch in the last 9 months, you will not get every feature in iPhone 4.0. Apple was not specific on these feature degradations, but they did say that only iPhone models marked 3GS (note the "S") or new iPod Touches released after September 2009 will be the only ones to receive the multitasking. Apple claims that the older phones cannot run these features, and I think that more likely it is just that the older devices don't have the RAM and/or the processing power to run these features well. In other words, Apple could allow users to do these things, but they're probably right that these older phones would be too slow for comfortable use with these new features. In my experience, my iPhone, which I got about 18 months ago, was nice and fast on the iPhone 2.0 that it was released for, but once the iPhone 3.0 OS was available, my device definitely was a bit more full-featured but also a bunch more sluggish. Also, the 3GS is notably faster, so many of the more demanding apps available today run slowly or even crash on my iPhone 3G. What does this iPhone update mean for me? I'll probably get a new iPhone sometime this fall after my two-year contract is up. Most likely, there will be a speedy new iPhone that runs lightning fast before that time comes. When I bought my iPhone 3G 18 months ago, there was no phone that was half as useful and cool. These days, the iPhone 3GS is on the same plane or maybe even a bit behind phones that run Google's Android OS. But with the promise of iPhone 4.0, Apple keeps up with the competition and, with some potential new phone models this summer, they can even stay ahead of the curve. Now I'm just hoping for one with 128GB of flash memory on it so I can even hold all my music and podcasts in one device! Yesterday morning Apple Inc. went ahead and showed the world their newest gadget, the iPad. In pretty much every way, it is just an oversize iPod touch, but Apple hopes you will think it's much more than that. 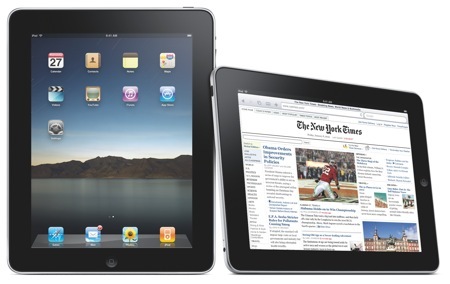 Steve Jobs is quoted as saying that the iPad is "a revolutionary device" and is "magical". Where's the magic? Well, it's thin. A half inch thin with nicely tapered edges on the back to make it look even thinner. The back cover is a nicely-curved piece of aluminum and the front is a beautiful 9.7 piece of glass with an LCD screen behind it. The screen is bright has great viewing angles but they still pack 10 hours of battery usage (and weeks of standby) into the guts behind the screen. And, if you do go to the Apple Store and try one out in a couple months, you will most likely enjoy touching the screen and watching a video on it. But I don't think it's magical or that everyone need save up their pennies to get the $499 device. On the stage that they presented it, Steve Jobs and Phil Schiller demoed the new Apple iPad while sitting in a cushy living-room style chair. And that's just what Apple hopes you'll think you need. I carry my iPhone when on the go. When I need to get serious work done, I go into my room and work on my laptop computer. But although my laptop is portable and I could bring it into the living room for hanging out or personal entertainment, Apple would rather see me keep this lying about the living room. I guess I wouldn't mind, but I'm actually plenty comfortable watching videos and doing pretty much everything on my MacBook Pro or iPhone, thank you. There will be the millions of Apple fans who will get one and maybe the rich who want another unique computer will get one, but it's not yet apparent why I'd want an iPad if I've got the rest of the Apple family covering my needs. As per usual, Apple has taken their popular, built-in iPhone apps and made them even more impressive. With about 5x more screen real estate, the ability to browse through e-mail, contacts, calendar, photos and videos is even better looking and there's much more room for ancillary features and buttons all over the screen. And, of course, web browsing is really smooth and slick-looking. Apple has also re-built their iWork suite for the iPad, building entirely new and intuitive ways to enter text and manipulate documents. One of the standouts in this area is the input pads replacing the virtual keyboard: one that is a number pad, one that includes more of the common functions, and one that makes it really easy to input dates. Also, there's simple and beautiful interfaces for moving around slides in Keynote and text in Pages. While these iWork apps are not as full-featured as the Mac OS X counterparts, most of the features of its bigger brother are retained, as opposed to the iPhone and iPod touch, where users can currently only view these documents. The iPod functionality looks more like iTunes in its browsing and playback functionality as well, thanks to the bigger screen. One of the main features of the iPod touch and iPhone is the myriads of apps that are available for free and for pay on the iTunes App Store, and the Apple iPad piggybacks on that very well. Any iPod touch/iPhone app will run in a fifth of the screen area just as it is on the iPad's smaller family members, but you can also quadruple the size to get a more full-screen feel to your old apps. Even more exciting, though, is the great new ideas that developers will be coming up with over the coming months for the iPad. At the event, The New York Times showed a beautiful app that displays the paper's content in a way that resembles paper really well but also gives much more control over to the user in that they can change the columns, text sizing, and easily flip through sections without ever losing that newspaper feel. No word of this yet, but I hope that an easy way to browse my favorite print magazines in full color comes out of this. Gameloft and EA showed off games that use the bigger screen, touchscreen area and the new Apple A4 processor to show better graphics, but also to add more display bells and whistles such as maps and gauges as well as more controls, some of which can even be moved around the screen to wherever the user preferred to have them. Also, MLB.com showed an updated version of their popular app that got me excited for April's season opener: the Gameday screen on the Apple iPad has pretty much every statistic that MLB collects available on screen or with one swipe of the finger. Also, they showed full screen live games and the ability to pull up lots of those statistics right on top of the live video in transparent overlays. That will sell the iPad to those who want more than their transistor radios to follow baseball, I think. The major problems with the Apple iPad are almost exactly the same as the iPhone: Apple is too controlling to make it a very useful device. Developers such as EA, The New York Times, and MLB.com have been able to create cool apps. But, as I said months ago, there are many ideas developers have for apps for iPad/iPhone, but they are not sure if Apple will let them sell it because it may compete with something Apple is building or one of Apple's partners has created. Also, especially with a more powerful machine such as the iPad, Apple needs to be allowing the iPad to run more than one program at once. Yeah, only allowing one program to run makes the iPad seem faster, but all we'd really like to do is play Pandora (or some similar live streaming audio) in the background while browsing a site or working on a document. Apple, in my opinion, needs to get these types of things fixed and figured out before real success will be seen among power users. On the other hand, the reason Apple loves this closed platform they've built is because they control all of it and get a couple cents for every transaction made with their device. There are other downsides, as well. It's not a great movie device because the screen is square and not widescreen so over a third of the screen will be black bars when viewing movies and video podcasts. The base product has WiFi including the speedy 802.11n, but another $130 (and then $30/month) is required to get 3G cell phone data access and GPS capabilities, so it is not cheap to use this out of your house where you have the WiFi. Also, there are a number of features of the Apple iPad that require fairly regular syncing with iTunes in order to be useful. In a related note, there's no way to use the iPhone or iPad as a USB hard drive and it is unclear as to how you get your iWork documents on the iPad, especially now that the iPad has (up to) 64GB of storage. Even though I see no need for an iPad in my living room and in the living room of most people, there are some applications that may be perfect for the iPad. One thing that Apple announced was the new iBook store. In the iBook store, users of the iPad can purchase bestselling books that include full-color photos and even videos and users can change the font size and even the typeface of the book on the fly. This may be a preferred view for those who currently enjoy the Amazon Kindle, and there's talk of the iBook store selling textbooks and therefore it may be popular to give to students instead of carrying around piles of textbooks. Persons who are on the road and manipulate geographic data will enjoy applications that use the big screen for maps and built-in GPS and compass data. Medical applications may find the iPad useful, although some expect that the lack of the ability to write on the iPad to be a downside. Another interesting application will likely be for artists, as some have been using the iPod touch and a program called "Brushes" to make professional artwork and the brilliant 9.7-inch display will no doubt bring in more creative opportunities. Overall, the Apple iPad is a fairly impressive device looking for a market. Only time will tell what that market is and how successful it will be. Recently I've been discussing with friends what I usually do on the weekend. My weekend isn't completely work and it isn't completely play, but I guess my favorites are the ones where I do a bit of both and just see where it goes. First, I'll go over what's not my ideal weekend. I guess I'm not that outdoorsy of a person that I want to be outdoors the whole weekend. I do know people who almost need to be outdoors to relax and they seem to love to have a weekend away from everything at the cabin. But I definitely find that to be a waste of my weekend - there's just too much downtime with nothing to do, unless there's a good book to read, although I can't really read a good book for more than a couple hours at a time. Of course, the weekend needs a bit of fun. First of all, whenever projects are going on, there is plenty of great music to listen to at a reasonable (or loud) volume. If learning or working on a project is not going well, I'll take a break and watch a show on Hulu or from a podcast I subscribe to. Also, most Friday nights and at least a couple hours of Saturday and Sunday have to be some sort of activity hanging out with friends or family. Of course, this type of weekend is not as fun as spending the weekend in Chicago, going to a MuteMath concert or a cookout at the parent's house, but it is definitely a favorite mode of a weekend. I feel like I have accomplished some of my personal projects and had fun in the process. Of course, I expect your weekend to be a bunch different. What's your favorite way to spend time out of the office? 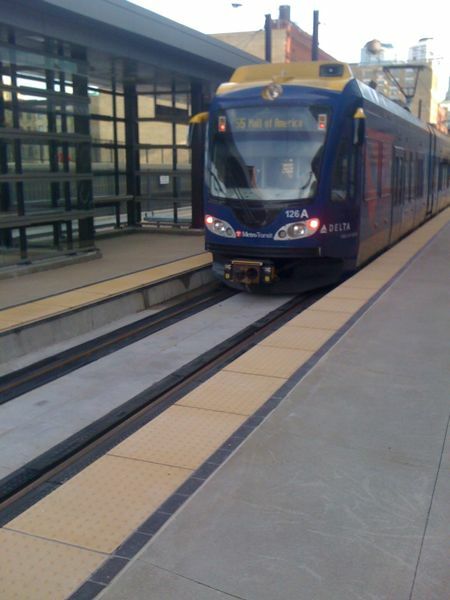 Last weekend, before attending the Mute Math concert, I took a walk down the newest couple of blocks in MetroTransit's first light rail line, the Hiawatha Line. I snapped a couple photos and had some interesting observations that I wanted to mention. To step back, here's the view from across the street on the corner. Here you can see more of the stadium building as well as the light rail going by below. The stadium building is still under construction so most of it was blocked off, but there were a couple interesting parts visible on this, the northeast side of the building. 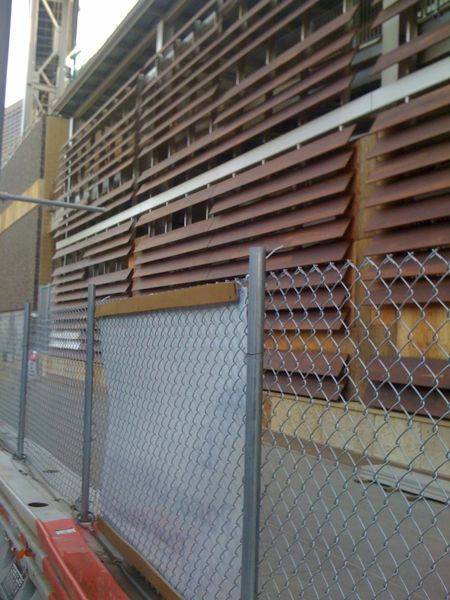 First, in the middle of the northeast wall there's some windows with a really odd wooden paneling over them. It seems like an eyesore to me, although my guess is that the street-level windows are just boarded up until the construction is finished. 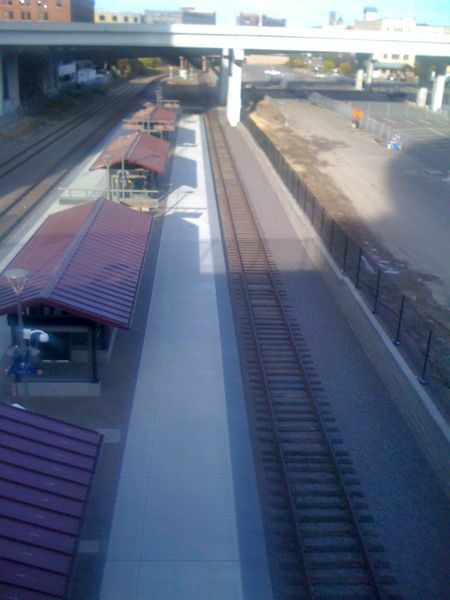 Along the northeast side of Target Field is the new Target Field light rail station, which is pictured here and is shown looking in a southeasterly direction, about 120 degrees to the left of the above photo. 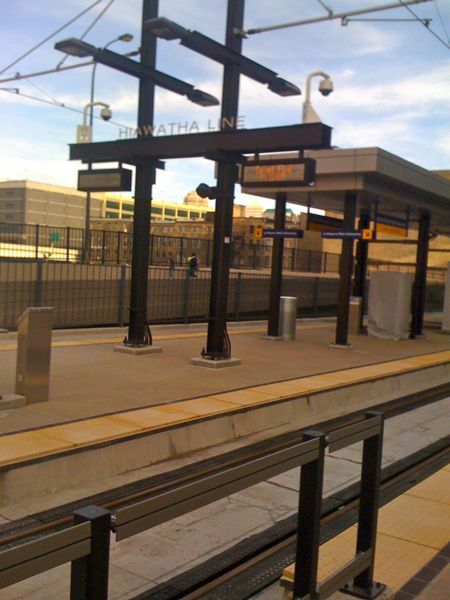 I do find it odd that the sign on the station says "Hiawatha Line", mostly because in four years this station (and all downtown Minneapolis stations) will serve both Hiawatha Line trains as well as Central Corridor trains to St. Paul. 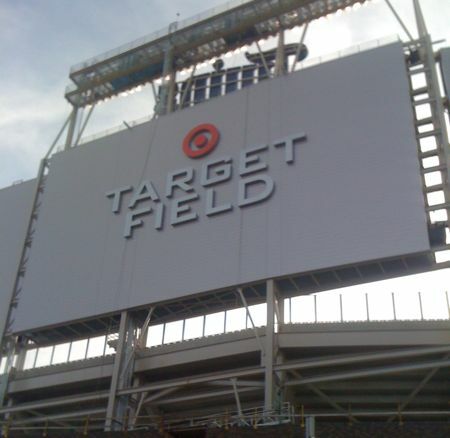 Will they take down that sign in four years or add another one? Or will they keep it up and it will confuse game attendees? 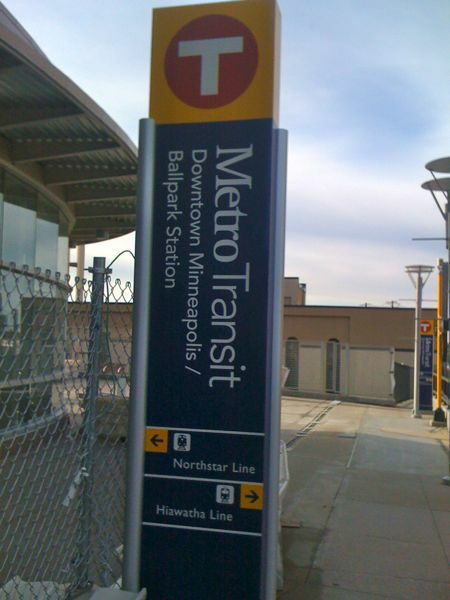 The Northstar Commuter Rail opens on November 16th, and the Target Field light rail station will open then if not before. 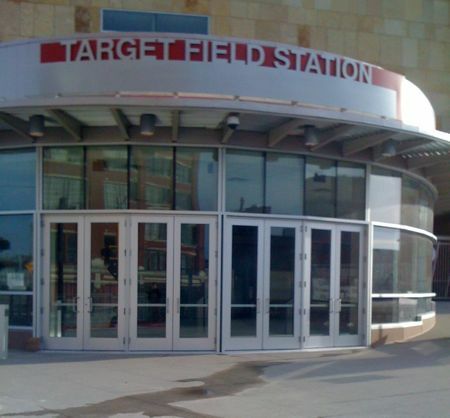 Actually, while I was there, trains were driving through Target Field station and stopping like they would for riders, but the station platform had signs that said it was closed for construction even though it looked 100% ready to go. 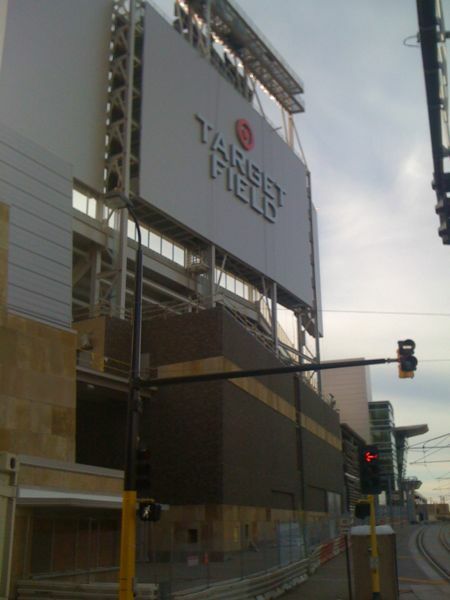 For more information about the new operations at Target Field, visit MetroTransit's official site at MetroTransit.org. I am leaving on Friday night, so I was a bit short on time to get the product. So, I went to the most convenient location: the Best Buy in the Mall of America, which is close to work. Sure enough, they had the product there. But wait? Wasn't the MSRP at $69.99? Yeah, it is, but Best Buy is charging $72.99! Well, I need it pretty quick and I don't have time to order it online, so I went ahead and purchased it. With MN sales tax, my total expense was $78.30. After the fact, I decided to do some online price comparison. Of course, I went to Amazon.com, where they verify that the MSRP is $69.99. But lo, they're selling it for $46.99! Just as a comparison, I priced out overnight shipping from Amazon.com for the same product, and Amazon.com will get it to my door tomorrow for $64.97. Why the discrepancy? First, Best Buy knows that you came to their store to get this item. The Griffin ITrip is not like the DVD, CD, or even that Nintendo DS game where you just say, "Yeah, that's not too pricey, I'll get this too." You need the iTrip. Therefore, Best Buy is going to make sure they can get all the profit out of the iTrip that they can. Amazon.com, on the other hand, offers the iTrip at just a bit above their cost of getting the product, most likely. If we assume both Best Buy and Amazon.com have get these units for the same price from Griffin, Best Buy just got over 35% of my product's price as profit. On the other hand, Amazon.com didn't charge me the 33% and kept the couple percent as profit and operating costs. Is this highway robbery? Not really. 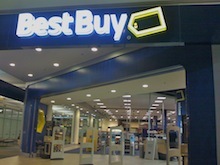 Best Buy has massive costs they have to cover, such as renting all that retail space and paying undereducated employees. The part I think is highway robbery is the extra $3 over the Manufacturer's Suggested Retail Price (MSRP). I probably should have left and gone to the Apple Store, because if they have the product, I doubt they sell it for more than the MSRP. 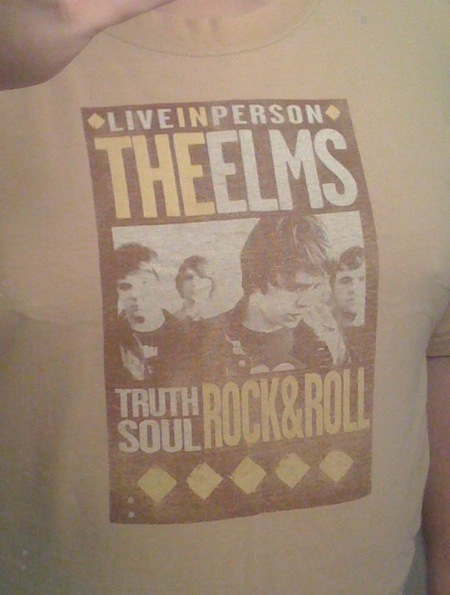 I got this shirt, I think, the first time I saw The Elms play at Club 3 Degrees in Minneapolis, MN. That must have been sometime in 2003, I think, but I'm not sure. 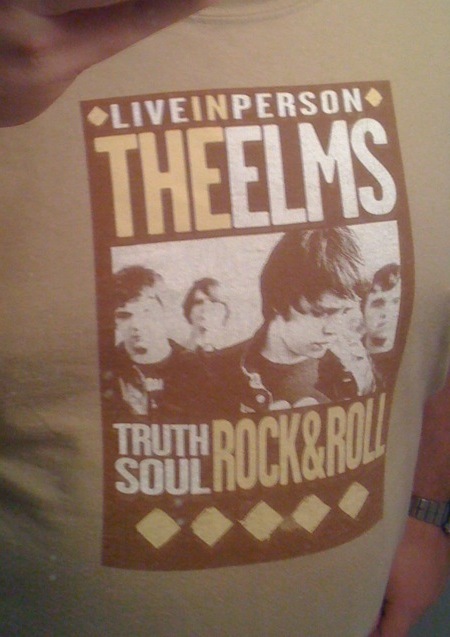 It's been one of my favorite shirts ever since then and I wear it often, so it has gotten worn out pretty well. 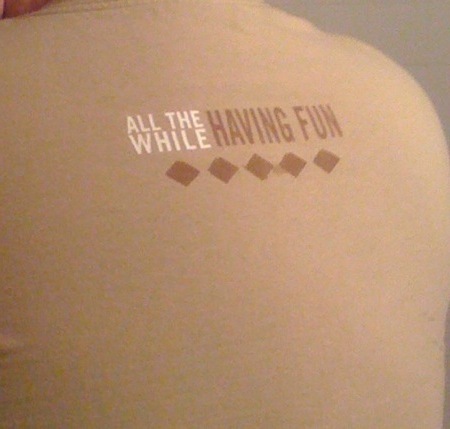 The graphic on the front (above) is faded and the edges of the shirt are getting a bit ratty. By the way, earlier this month The Elms released a brand new album, The Great American Midrange, which is easily the best album of their career. Check out my review of the album on inReview.net and visit the band's website for more information. This morning it was announced that Marvel Entertainment is to be acquired by Walt Disney Corp. for $4 Billion. Many of my friends, as well as myself, seem to be a bit worried and skeptical about the future of their favorite Marvel characters. But, upon thinking about it more and more, I think this is a sound business decision and Disney will likely handle it well. First, many Marvel fans seem to think that being associated with Disney means that Spider-Man and Wolverine will be portrayed as kids stuff just like Mickey and Hanna Montana. To many, that's all the Disney brand means. Remember that Disney is a multinational corporation that owns Disneyland, Disney World, Walt Disney Pictures and PIXAR, as well as other Hollywood studios such as Touchstone Pictures, Miramax, and Hollywood Pictures. Disney also owns The ABC Network, ESPN, as well as a couple music labels and a radio network. People don't think of Wes Anderson's first four films, most of Quentin Tarantino's films, as well as Scream, Spy Kids, and Farenheight 9/11, but that's because Disney doesn't stick the mouse ears right on the screen. Not everyone in the world is fans of Mickey and Donald, and Disney still does business that caters to them. Second, Disney is always looking for some of the hottest properties out there. Marvel Entertainment, a leader in the comic book world, is definitely a great new business to get into when looking for more avenues to make profit. Marvel used to sell the movie rights to other studios for such things as X-Men, Spider-Man, and The Fantastic Four. But more recently Marvel Entertainment has been financing and producing the movies themselves. So far, with films such as Iron Man and The Incredible Hulk, the production quality and the reception by the fans has been even better than before Marvel Studios was formed. Marvel and Disney did say that the distribution agreements with Paramount, Sony, and Fox are going to be continued. I can see Disney wanting to buy back some of these rights, but it shows that Disney knows Marvel has done things right and they don't want to ruin that for the rather small distribution fees. Also, the news also cited that Disney has many hot properties for the female market such as Hanna Montana and The Jonas Brothers and are looking for more products to capitalize on the male teen and adult, and that's right where Marvel is at the top of the list. Third, I think Marvel does stand to gain from the help of Disney. George Lucas may be known as the one who started "merchandising" for movies, but Disney definitely brought merchandising to a whole new level and does it in smart, intelligent ways that cater to their audience. Will we see cool Superman or X-Men rides at Disney World? That could be awesome! Will we see more Iron Man toys? Probably. One quote from Disney CEO Bob Iger, who brought Disney back from the brink of losing its magic touch four years ago, was that PIXAR Animation Studios is excited about working on Marvel properties. (Think the action of The Incredibles with some of the world's best-known comic book characters.) Also, Marvel has over 4,000 characters, but they don't really have the money to make movies for even a fraction of those characters. With the financial muscle of Disney, I think we can expect plenty more Marvel content in the future. Don't get me wrong. Disney could screw this up really bad. However, for these reasons and others, I think it's too much in Disney's best interest to let Marvel do their thing and help them out. In that, I mean that Disney sees the dollars rolling in with the acquisition of Marvel, as long as they stay smart. The last four years since Bob Iger's takeover as CEO has been Disney's best in the last decade, and with smart business decisions like this, I think Disney may get even better. Today's feature is a shirt that is seldom worn. It doesn't sport a cool band name or even some geeky phrase, but it does show the skyline of one of my favorite cities: Chicago. In April 2003 the University of St. Thomas Liturgical Choir went to Chicago for an extended weekend and it was lots of fun. Actually, we had so much fun, this touristy shirt was an afterthought purchased while loading up the bus to leave. It was purchased from the hotel gift/convenience store of the Holiday Inn we stayed at. Despite the last-minute purchase, I do enjoy the shirt. 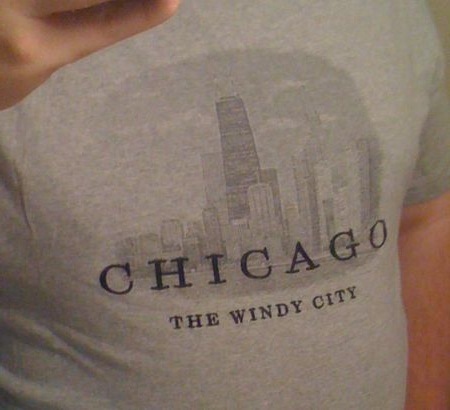 It's got a nice look at the Chicago skyline and looks great. I think the reason I don't wear it too often is because it's a bit small and the lettering is embroidered into the shirt and therefore the way the shirt bunches up around it feels odd while wearing it. Although, speaking of Chicago, I'm planning on going to Chicago at least once this September. Over Labor Day weekend, my parents and I are going to hang out in the parks downtown and meet up with my sisters who live a couple hours away. Also, I'm seriously considering a September 16th trip to Chicago to catch one of the final U.S. tour dates of my all-time favorite band, delirious?. During these trips, I hope to catch up with some of the things that I've yet to experience in Chicago or want to experience again. First, The R!OT and others have said that I have to get some authentic Chicago pizza, and most say Giordano's is the place, so hopefully we'll be able to do that. Last year, while in town for the Music Builds tour, we also found some fun Chicago places that we liked. My favorite was Epic Burger, a classy new burger joint that also had really good fries for a pretty good price. My sisters fell in love with Argo Tea, a very nice downtown tea shop as well, and although I don't really drink tea, it just smelled nice in there. Of course, my family loves walking down by the water and hanging out in the myriad of park spaces along the water, especially Millennium Park and more.